After wandering through the Sleepy Hollow Cemetery and checking out The Old Dutch Church last Friday, Amy, the girls, and I grabbed lunch at The Headless Horseman restaurant then made one more stop before heading back to Connecticut. 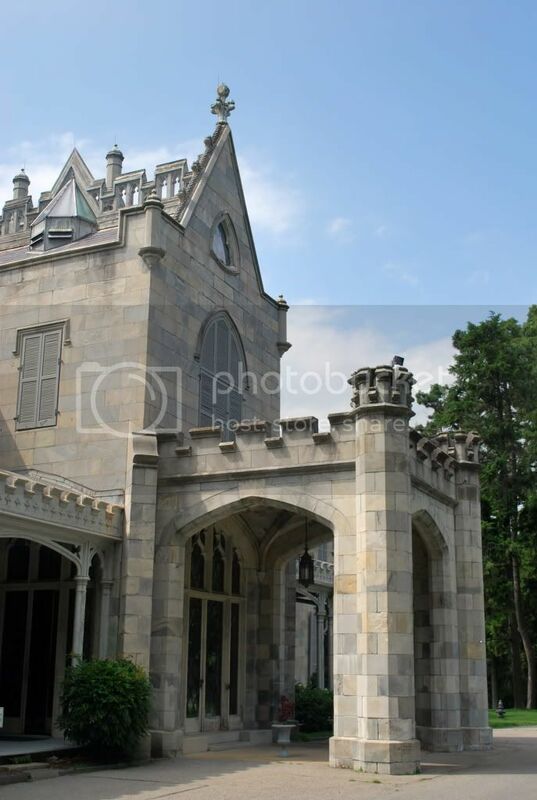 This humble litte abode which was built from limestone quarried from up the river at Sing Sing is Lyndhurst Castle - one of the finest examples of Gothic Revival architecture in America. 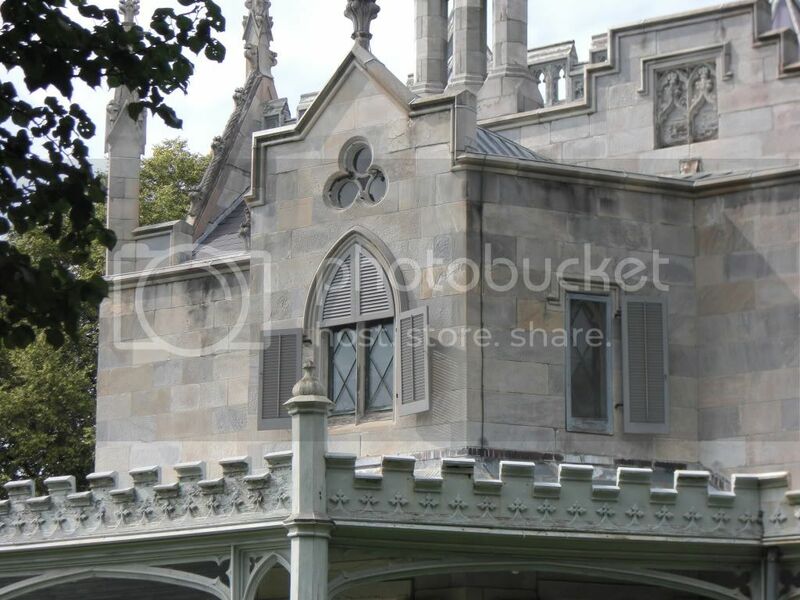 The house, if you can call it a house!, is located within a 67-acre park that also contains the cast iron structure of a once beautiful conservatory (the first in the United States) as well as gardenesque landscape that was originally designed by Ferdinand Mangold who was the landscaper at Lyndhurst for 40 years. 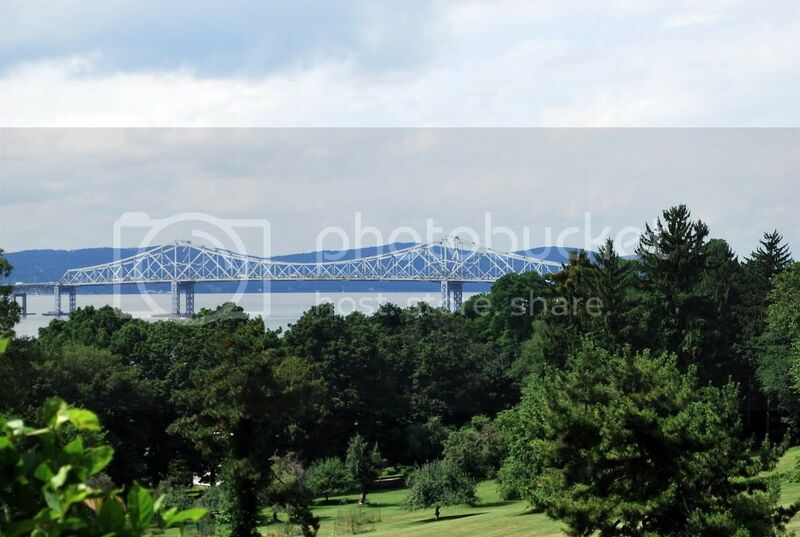 Overlooking the beautiful Hudson River and Tappan Zee bridge, Lyndhurst began as a summer home on 50 acres of farm land owned by then Mayor William Paulding, Jr. of New York City. Mayor Paulding hired architect Alexander Jackson Davis, who was one of the most successful and influential American architects of his generation, to design a "small" place for he and his family to retreat to. 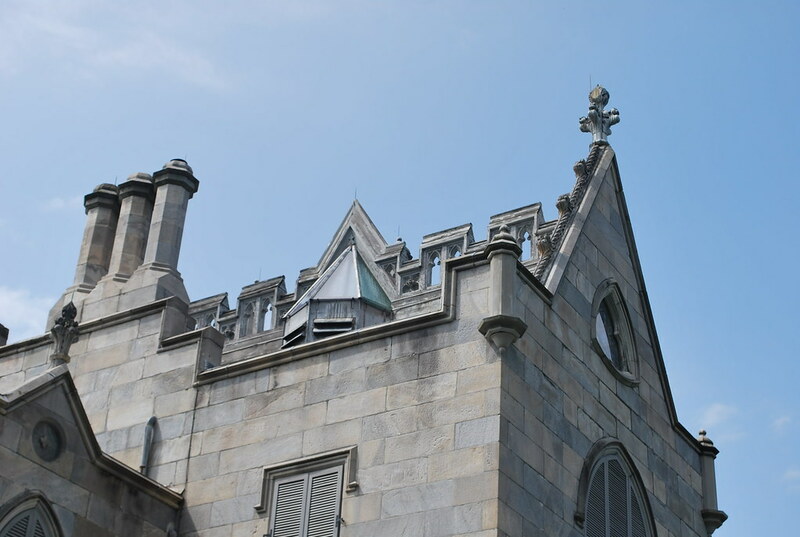 Originally named "Knoll", it was also known as "Paulding's Folly" because its turrets and asymmetrical outline were unlike most homes constructed in the post-colonial era. In the 19th century, though, romanticism dominated the arts and that included architecture so even though people initially criticized the design, they were still fascinated by it. It's easy to see why! A.J. Davis completed what was to be the first phase of the home in 1842 (about the same time he designed the Wadsworth Atheneum in Hartford which is the oldest public art museum in the United States). Additionally, he designed most of the furniture which can still be seen when taking a tour of the house as when one family would move out, they would leave all of the furnishings behind. In 1860, the house became the property of George Merritt, a New York City merchant, and it was he who hired employed the German horticulturist Ferdinand Mangold to be in charge of a permanent staff of 100 laborers to transform the then 194-acres of farmland and swamp into elaborate and more modern grounds. Merritt changed the name of the home from "Knoll" to "Lyndenhurst" after the Linden trees that were planted on the property; Merritt also brought architect Alexander Jackson Davis back in to expand the house and double it in size. 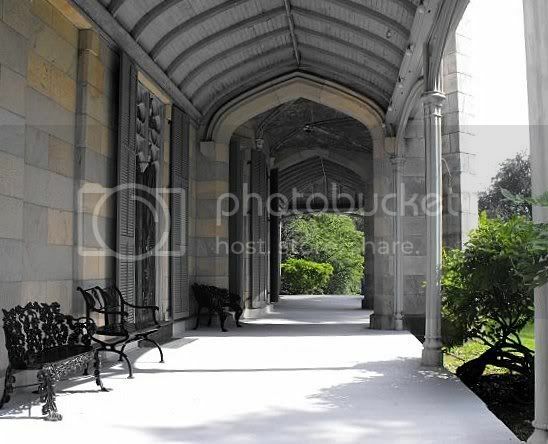 It was at that time that the new porte-cochere (portico) was designed along with a sprawling veranda that surrounds three-quarters of the house. A huge north wing was added that included an imposing four-story tower, a new dining room, two bedrooms, and servants quarters. 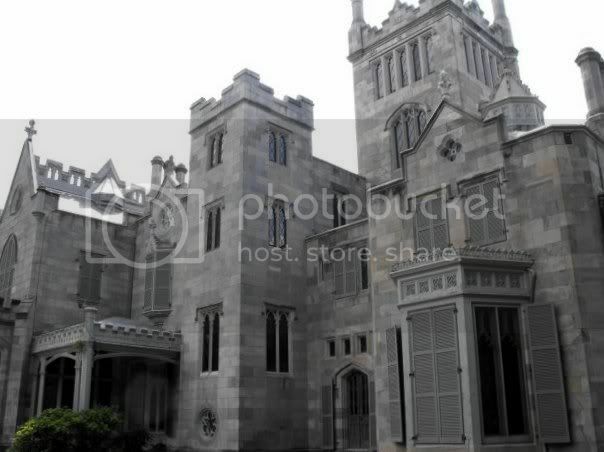 Unfortunately, and much to our dismay, pictures are not allowed inside the castle but if you'd like to take a peek at what's in there, please click here for a virtual tour provided by the official website for Lyndhurst. 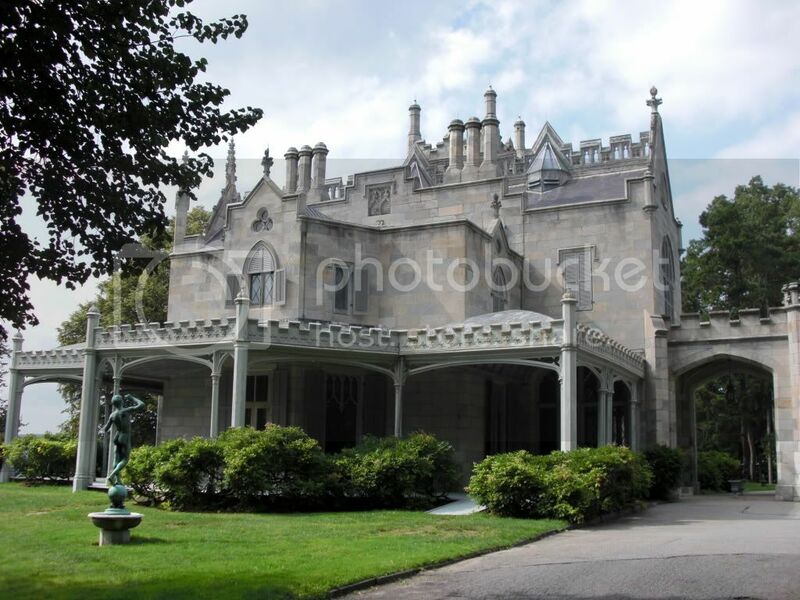 In 1880 ownership of the property, and its name, changed for the last time when it was bought by railroad magnate, Wall Street tycoon, and reported robber baron Jay Gould as a summer home for his family of six; at that time he shortened the name to "Lyndhurst". When his health was impaired by tuberculosis, the home served as a country retreat for Gould until his death in 1892. The house was then purchased by Jay Gould's oldest daughter, Helen, who bought it from her four brothers and younger sister. Helen Gould was quite the philanthropist and when she married Finley J. Shepard, the man who pulled her from a horrible train wreck, she invited 3,000 homeless families to her wedding reception in New York City. Helen and Finley along with their three adopted children, one foster child, and two nieces lived at Lyndhurst until her death in 1938. Following his wife's death, Finley then sold the house to Helen's younger sister, Anna - also known as the Duchess of Talleyrand-Perigord of France. Anna decorated two of the upstairs rooms to look like those in a French chateau; some of the furnishings in those rooms date back over 500 years. Talk about beautiful! 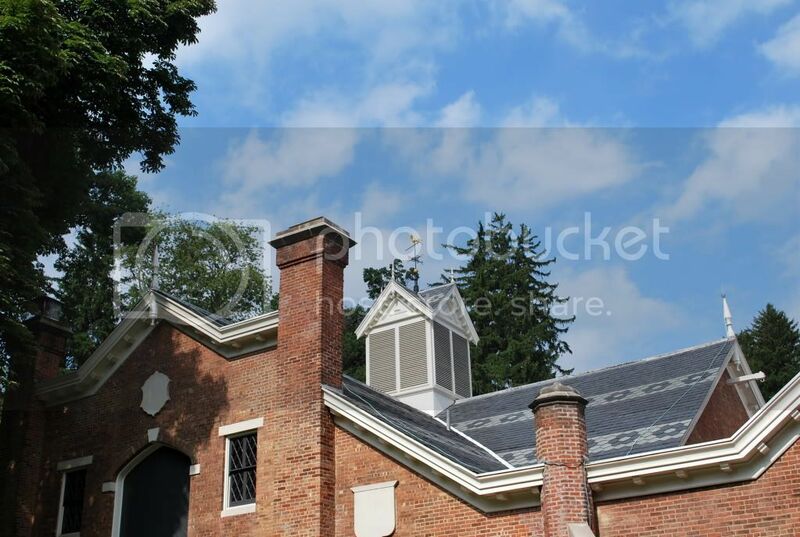 The house and grounds, including the beautiful stable above, stayed in Anna's possession until her death in 1961 when the 67-acre estate passed to the National Trust for Historic Preservation which now maintains the buildings, the grounds, and the decorative artworks that were entrusted to them. Our tour guide, Eddie, was very knowledgeable and you could tell that he really loved his job of telling visitors about Lyndhurst and the families that lived there. In particular he seemed quite in awe of Helen Goulding and when he spoke of her it reminded me very much of when Mr. Collins would speak of Lady Catherine de Bourgh in Pride and Prejudice! Still, she did sound to be a wonderful woman who was way ahead of her time and she seemed to have no problems in sharing the vast fortune that her father had amassed with those less fortunate. Truly a woman to be admired. One of the main things that we all found fascinating during our tour was the fact that inside the house there were a lot of faux finishes. Apparently during that time, it was quite fashionable for architects to use paint to turn plain pine into heavy wooden beams as well as marble pillars and other stonework. The only 'real' marble used inside the house was on the fireplaces but you would never have been able to tell that if your tour guide didn't tell you ahead of time. It was really quite ingenious and made the tour even that much more interesting. I really wish I had pictures to show you! To be honest, when I first thought about visiting Lyndhurst, I wasn't too sure how enthusiastic the girls were going to be about touring an old house but it turned out that they both really enjoyed it and found it quite fascinating (maybe there's a tiny bit of my love of history in them after all??). Their only regret was in not being able to take pictures inside! Gee, seeing that they liked this old house, perhaps I shall have to take them to the mansions in Newport at some point after all! and then you must take them to the plantations of South Louisiana. oh and since you're all into vampires. Such a beautiful place - can you imagine how much that would cost to build today?!?!? We've been to Heart's Castle, in San Simeon (central CA coast, south of Big Sur). It's breathtaking, but I think the only philanthropy taking place was of the philandering sort! I am so glad you take these trips because it's probably the only way I can ever see them, and it's like I have my own private guide, who just happens to be an ace photographer! From the last set: I forgot to mention those doors! i have a "thing" for doors and I love those. And the deer? Breathtaking. Thanks, again. What a wonderful tour guide you are, Linda! I love the color variations in the limestone. I went over the Tappan Zee on my way back to Georgia last November. So close, and yet so far, eh? WOW, what an awesome tour. Thanks for taking us along! I've been to San Simeon and it is awesome. 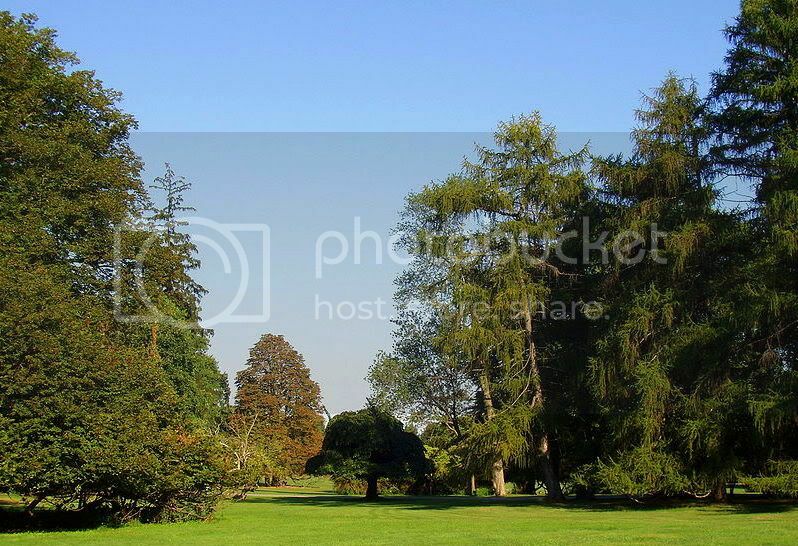 While I haven't visited the plantations in Louisiana, I've toured several throughout the south and they are grand. Best of all, many are haunted and have interesting tales. Yet another example of the beautiful history of our country. I'm glad you all enjoyed the trip so much! You always take such great pictures and give us so much info. :) Seriously, I wish I had you as a history teacher when I was in high school-I'd probably know more b/c I wouldn't have been so bored!! I was going to tell you about a restaurant in that area that we used to go to all of the time. They had the BEST pizza I've ever tasted. Sadly, when searching I read that it changed owners and is no longer the same. :( I think you guys would have loved it. I would have loved to see some pictures of the inside too. Drat, I just love touring old houses and seeing the furniture that was in style back in the day. Another interesting post! That mansion is incredible. Too bad about the photography ban. A great lecture tour, Linda. 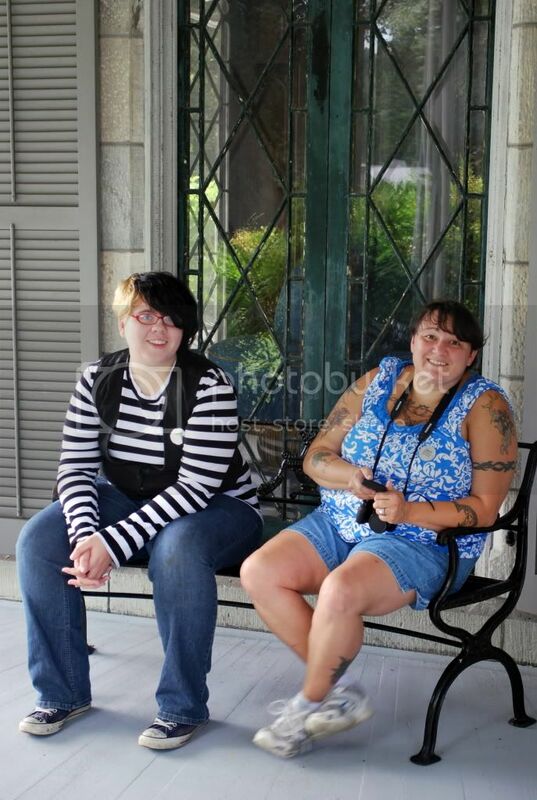 Who is sitting with Amanda? 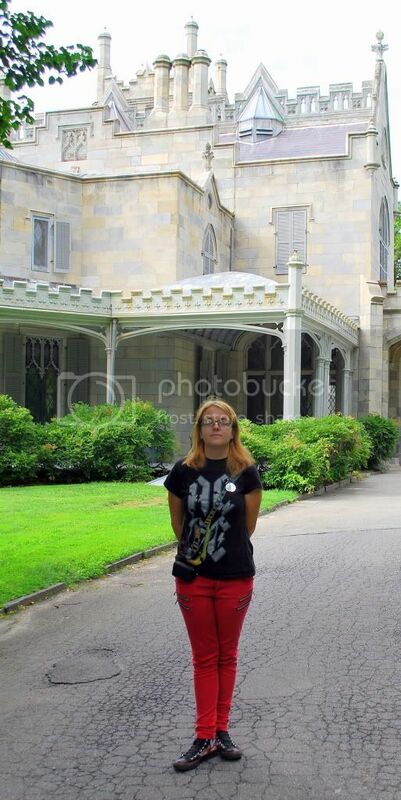 The tour and photos were wonderful and as always a great story to go with it. Awesome job of reliving the tour for us Linda!!! Thank you bunches. i love your vacation! not many would love the cemetery tours but i would!! the best one i ever went to was key west. i love the old tombstones with so much character. now they just have a plain marker or even worse, a plaque flat on the ground. Thanks for this. I'm doing a project turning sleepy hollows story into something realistic and fantasy both for my art project and your blog was the only place i found everything together! Balloons? We Don't Need No Stinkin' Balloons! Let's Go to the Hop(yard)! Return of the Plushies ... Sort Of!